The coffee spoon is your coffee's greatest ally, so choose it with the same care as your cups and the coffee itself. Our experts have selected the biggest brands at the best prices to make your life easier: Bodum, Alessi, Motta, Melitta, Judge: the choice is up to you! 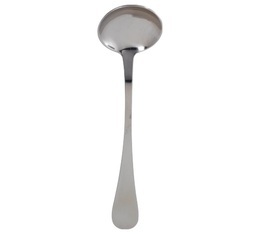 Stainless steel tea or coffee tasting spoon. 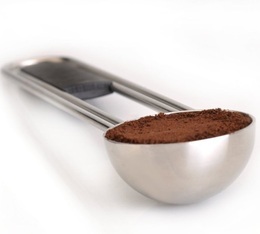 The coating on the spoon will not add a metallic taste to your coffee, thus ensuring the most authentic taste possible. The Hotel Line BergHOFF coffee measuring spoon means you can prepare your coffee easily, quickly and without making a mess. As a bonus, this measuring spoon (made from 18/10 stainless steel with mirror-shine finish) will keep your coffee packet closed for optimum preservation of your coffee beans! There is also a spot (made from black ABS plastic and a rubber coating) to add your logo to the handle! Dishwasher safe. 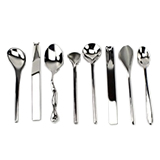 Try this set of 6 latte spoons by Bodum. These transparent plastic spoons are perfect for your latte macchiato or café liégeois!